Turkish Scientific and Research Association in Turkey has one of the leading research and development center, called Marmara Research Center (MRC).This center carries all the activities in multidiscipline research and development for Turkish Industry.One of the institute of MRC ,namely Material and Chemical Technologies Institute has NDT group mainly concentrated in the application of ndt techniques and education,training and certification of the ndt people. MRC - NDT group made an agreement with Danish Force Institute both for the EN 45013 for the certification bodies and EN 473 for examination and certification of NDT personel.With this joint work MRC - NDT people had already got their level 3 certification in RT and UT .Now MRC is organising ndt level courses and certification programmes with Force Institute. Quality control demands coming from Turkish Industry is met by MRC-NDT group by using radiography, ultrasonic, magnetic particles,liquid penetrant methods according to the desired standarts.On the other hand this NDT group also designs and produces ultrasonic probes for general and specific purposes. 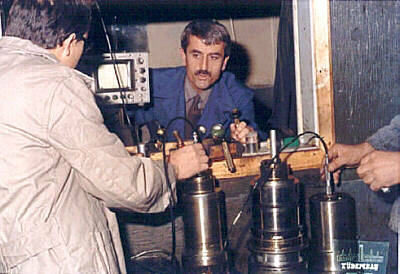 Several ndt applications at Turkish Industries and training and certification programme carried out by MRC are explained in detail, such as "Ultrasonic Inspection of Cartridge Cases","Ultrasonic Attenuation Measurements","Cast Iron pieces control by Co- 60 " and "Radiographic Control of Howitzer parts". 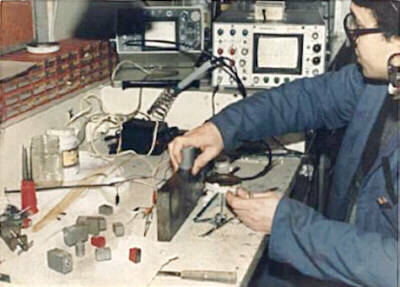 The Nondestructive testing activities started at Marmara Research Center (MRC) as an indusrial research and projects.The first project was about the welding control of the joints of the "First Suspended Bridge of İstanbul" in 1972.NDT group of MRC used Ultrasonic testing and X-Ray radiography for that project.Since than NDT activities developed in MRC group and started to apply almost all the NDT techniques, namely Ultrasonic,Radiography,Magnetic Particle, Eddy Current,Liquid penetration and acustic emission techniques.NDT techniques are gaining great attention from industry for the control of the industrial systems, production and service control of several materials.Technical staff and high quality equipments of MRC-NDT group is capable to answer all the requirements coming from Turkish Industry. The NDT activities can be classified into two groups.First one is to give a service to Industry and the second is to carry the research and development activities for industry. Besides these activities training courses were organised and works started to have an acreditazation for NDT laboratories according to the EN 45013 and EN 45001.The senior staff is trained by Danish Force Institute and certified Dantest-Cert according to EN 473.Level I,II and III courses for ultrasonic and radiographic tests are started in MRC-NDT group according to EN473 and those who are completed these courses and fulfilled the requirements of the above mentioned standart are having the certification exams from Dantest Cert. The NDT Laboratory of MRC is founded in 1972. The project named "Non-destructive Testing of 1st Istanbul Bosporus Bridge" was realised as the first industrial project of MRC carried out by the NDT team in the same year. Since than NDT activities are carried out and still developing effectively for the use of Turkish Industry. In MRC- NDT Group there are 4 experienced research scientists had trainings at Danish Force Institute and obtaiened Level III certificates both on UT and RT and they have Level II certificates from all the other techniques according to EN473 from Dantest-Cert , and 2 technicians with Level II certificates for are also currently employed. The facilities in the NDT laboratories. are available for the five main tests; namely, radiography (RT), ultrasonic (UT), magnetic particle (MT), liquid penetrant (PT), and eddy current testing (ET). The equipments are all mobile and used for both research and industrial service purposes. In addition to these the NDT Lab. Has also an AO Fiberscope for visual inspection, Acoustic Emission (AE) test system, and Dr. Forster conductivity measuring device. This laboratory is also conducting industrial contract projects to design and manufacture ultrasonic NDT transducers for particular demands from the industry. Among these special ultrasonic transducers for the testing of railway axles and for the testing of cartridge cases could be mentioned. Fig.1 shows some of the ultrasonic probes designed in the laboratory together with the measuring system and the probes which were designed and produced for ultrasonic axle testing are shown in Fig.2. Fig 1: Some of the ultrasonic probes designed in the NDT laboratory with a measuring system Fig 2: Center punch probes designed and produced for ultrasonic axle testing. The industrial service income of the NDT Group in the last five years, except for the projects given to the MRC and universities are given in Table 1. In order to fulfil the non-destructive inspection needs of Turkish Industry by being an accredited test laboratory, we have recently applied and acquired accreditation from Denmark-DANAK according to EN 45001 and 45013 and Quality Manual and procedures especially for UT and RT have already been prepeared and we are also planning to expand and update the laboratory facilities as well. The great increased about the use of ultrasound in NDT has led the need for improved ultrasonic transducers. Research was carried on the theory, design, construction and measurement of the ultrasonic transducers. An ultrasonic transducer laboratory has been established for this purpose. An experience on the design and production of ultrasonic NDT transducers has been gained. Now the laboratoy is capable of desinning and the production of these type of transducers demanded from Turkish Industry. An ultrasonic NDT system for the inspection of railway axles was developed so as to detect the fatique cracks which might occur during their service life. The special center-bore probes and angle beam probes including their piezoelectric ceramic crystals were designed and manufactured for inspecting the critical zones of the axles. Theoretical and practical training courses on the use of the probes were also conducted for the railway maintenance staff. The developed ultrasonic system is still being used in about 20 inspection stations of the State Department of Turkish Railway. From the investigations carried out by Exxon Research and Engineering Company., attenuation measurements, using conventional pulse echo ultrasonic flaw detectors were found capable of detecting the initiation of grain boundary fissuring associated with hydrogen attack in carbon and low alloy steel. We have been applying the periodic attenuation measurements for detecting internal hydrogen attack in C-0.5 Mo steel hydrogen treating units of ATAŞ Petroleum Refinery in Turkey during the refinery turn off since 1984 and the measurement results are evaluated by Mobil R&D Corp. / USA . Radigraphic tests and reseach are carried out in two separete laboratories, one of which is designed last year for thick materials by using Co-60 system. Demands from Turkish industry for the radiographic testing of thick and heavy parts are met in this lab. Among these we mention radiographic inspection of M52 TK/M howitzer cast parts. These parts are about 500 kg in weight and the material thickness varies from 50mm up to 150 mm. Radiographs obtained by using the Co-60 source and exposure of about 3 hours are evaluated according to DIN 1690 RV3. In this paper, Non-Destructive testing personnel training facilities in Marmara Research Center (MRC) and its importance for Turkey are presented. The training facilities were started in the beginning of 1998. The purpose of training is to qualify and certify the people who work in the field of Non-Destructive testing. The training activities have been carried out in good order since 1998 according to TS 7477 which is the equivalent standart of EN 473. The details of the courses that were given during the period of 1998 -1999 are shown in Table-1. Table 1: Various NDT Courses given in TUBITAK- MRC with the participant and certified participant number during the period 1998-1999. According to agreement made between TUBITAK MRC and Denmark Force Institute in the mid 1999,first the staff of NDT group was trained and certified with Level III on UT according to EN473.Than Force Dantest-Cert carried out 'Pre-auditing' according to EN473 for education and certification in MRC. The purpose of this agreed 'pre-audit' was to evaluate the course material, quality systems, test pieces, laboratory set up and facilities for practical and theoretical education/certification. It was also the purpose to guide the teaching staff for the EN-473 requirements and eligibility for examination and certification. And three researchers took the Radiography Test Level-3 course given from Force specialist in TUBITAK MRC in December 1999, succeeding the course-end exams they also have got RT level-3 certificates. It is important that such a level-3 course was carried out first time in Turkey and some NDT personnel from industry were also joined this course. Since than the Ultrasonic and Radiographic training courses are started to be given by MRC staff with a level III certificate and the PT,MP and EC trainings started to be given by Force Institute specialist than as a whole participant are started to be examined and certified by according to EN-473 . Participant have to prove by documents that he or she had successfully completed the minimum training and practical conditions given in EN-473 in order to enter the certification examsa requested by the standarts. In table-2, the duration of the courses take place at MRC in various methods and levels are shown. Finally, in the year 2000 course-end examinations will be carried out from Force specialist with a level-3 specialist from S&Q Mart which is the partner of Force Instıtute in Turkey as a second examiner. In the future, S&Q Mart specialist will be qualified as an examiner and after establishing an Independent Certification Body in Turkey.TUBITAK -MRC aiming and hoping to organise and to take part in the Turkish independent certification body according to EN-473. All these procedures are so important for Turkey because according to international economic and commercial agreements, each country must have its own auto-control mechanism that are valid internationally in production, service and commerce sectors. The author would like to express his sincere thanks to Mr.S.Tuncel and Mr.A. Biber for their contribution.